Animated Dudes is a platform game that's exclusive to the Tapwave Zodiac. There's eight worlds and your mission is to stop Dr. Barrell from building a sludge manufacturing plant on the Moon and pouring sludge all over the Earth. 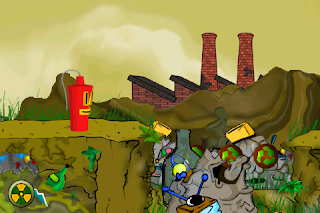 There's three playable characters; Slime (spits slime at enemies), TNT (uses its fuse as a whip) and Plunger (can double jump and use air attacks). Junkyard world is mainly platform based but it does have an auto-scrolling section where you ride a truck and deal with incoming birds and bombs. It's nightmarish due to the immediate difficulty and the fact that there's little room to manoeuvre. Forest is littered with blind jumps and unavoidable enemies that only come into view at the last second. Most of the time you succeed it's down to pure luck rather than skill! The Sewer has a neat vertical chase sequence but the screen tearing makes it easy to mistime a jump. The game also crapped out on me in one level by making all enemies invincible! Northlands and Desert worlds are more of the same but they exhibit poor-pacing due to the slightly decreased difficulty. The rest of the game is brutal and includes France (rooftop platforming as you head to the Eiffel Tower), USA (auto-scrolling levels where you ride a skateboard in a bid to collect 475 icons), and the Moon (side-scrolling shooter with horrendous controls). The bosses are mildly interesting but their projectiles sometimes blend into the background, and the in-game camera can be erratic. And then there's the dreadful save system; after each level your progress is automatically saved but if you lose all ten lives and reload your file you're dumped back at the opening tutorial! The only real highpoint is the crisp art style which reminds me of Earthworm Jim (1994, Mega Drive). Animated Dudes is a game that really could have used some difficulty settings (as well as a working save function!) to off-set its focus on extreme trial and error. Like Tempo (1995, Sega 32X) it has a fun art style and tons of personality, but it simply doesn't have the gameplay to back up its visual presentation. Random trivia: The game was only available as a download title and never received an SD card release.